Max Dupain (1911-1992) was one of Australia’s great modernist photographers. He took up photography in his teenage years and studied at the East Sydney Technical College and Julian Ashton School. From 1930-34 he assisted Cecil Bostock, before establishing his own photographic studio in Sydney. Throughout the 1930s and 40s Dupain was best known for his fashion illustrations, advertising and social portraits which were regularly published in ‘The Home’ magazine until it ceased publication in 1942. During World War II, Dupain served in the Royal Australian Air Force and worked as a photographer in the Department of Information, Canberra. After the War, he aligned himself with the documentary movement in photography and his later work eschewed his earlier subjects and experimentation in favour of architectural and industrial work. 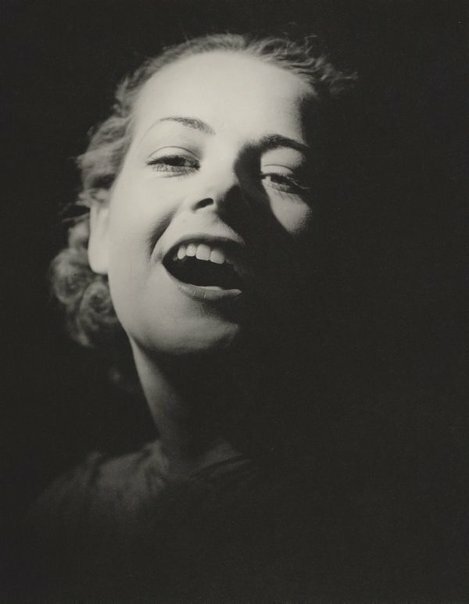 ‘Untitled (smiling woman)’ 1930s depicts a woman turned towards the camera, mouth open in a wide smile. The woman’s hair is coiffed and her face made up. This, combined with the exaggerated expression on her face and the dating of the work, suggests that this was a commissioned photograph for an advertisement. The aesthetic is suggestive of early Hollywood glamour stills, in which retouching and lighting were used to create images of iconic perfection. This can also be seen to reflect Dupain’s grounding in contemporaneous thinking around Vitalism.